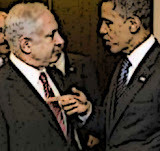 The popular meme among Obama supporters and Israel Laborites is to claim that Netanyahu ruined the relationship. But ruining the relationship was a strategic White House decision. much more subtle than that. obama was scamming Ross as well. Why won't the LA times now release the Khalidi video? "We have an administration that not only ascribes most of the Middle East blame to Israel, but also has banned “Islamism” and all related words, even “Islam” and “jihad,” from our national security documents.